As we’ve said before, at DMC, we love giving back to the communities we serve and helping our clients achieve success while working for a greater cause. In addition to helping our clients achieve their charitable goals, DMC takes on some causes of our own, and right now our goal is to help our friend, Norris, cross the finish line. 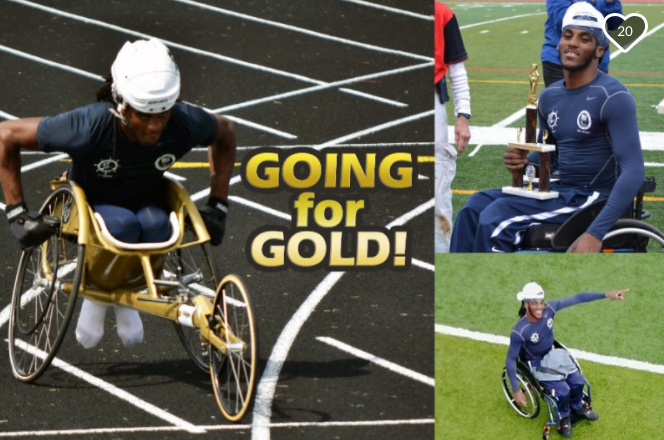 Norris is a 19-year-old with Cerebral Palsy- Spastic Diplegia, and he needs our help to achieve his dream of reaching the 2020 Paralympics in Tokyo. Although Norris has already made a name for himself by breaking several records, he is striving to reach the global arena which demands added dedication, training, and the best equipment possible. Norris is in need of Corima Carbon wheels and a roller trainer that will allow him to be able to train indoors, regardless of weather. The cost of the Corima 700 C wheels and training equipment is $4000 and the travel cost to get to Switzerland for the Olympic Trials will be just over $1000. To help our friend Norris, we’re working to share his story with as many people as possible. We’ve created the hashtag #NorrisNeedsWheels to spread the word on social media. To donate to the cause or for more information about Norris and his dream, visit the Norris Foster GoFundMe page. We thank you in advance for your generosity, caring, and support for this incredible young man and future Olympian! Keep up to date with our blog to learn more ways you can impact the community and help us work for the greater good!